My approach to support effective teaching is to create an environment that encourages cooperative learning in a relaxed atmosphere. Allowing everyone the opportunity participate in all aspects of the processes, encourage group discussions, and lots of experimentation. 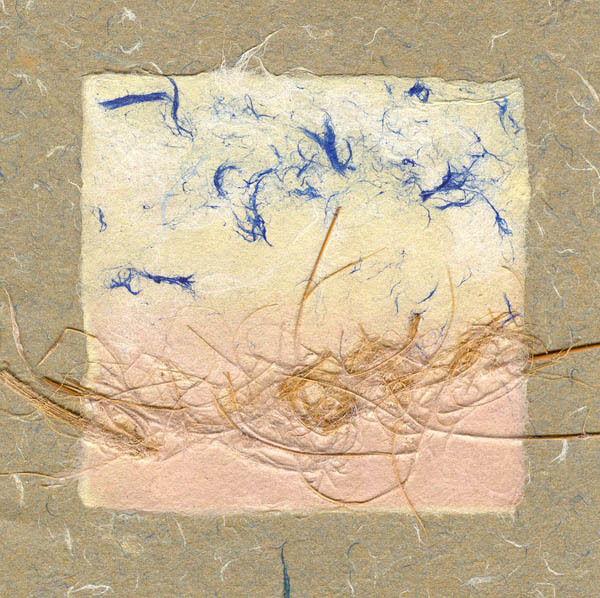 I teach the students traditional papermaking skills and then I encourage them to push the fibres to their limits – experimenting with all of the different techniques which invariably lead to serendipitous results. My workshops are suitable for artists, designers, crafters, print makers and those who want to learn a new skill or looking for inspiration. I welcome enquiries about organising workshops, courses and one-to-one lessons from schools, community centres and artists. Japanese handmade paper has become a popular medium. 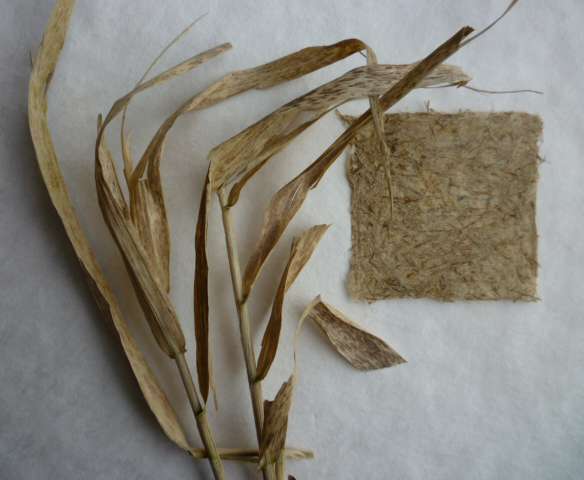 This four hour workshop for 1 – 3 students will introduce the process of preparing and pigmenting kozo fibres and sisal fibres that will be then be used to create both plain and decorative sheets. Let me introduce you to the practice of using Western style handmade paper as a creative medium that has become popular in current art and design practice because of its tremendous versatility. Maybe for a book, maybe for a special print project or maybe just to create some papers future idea. This four hour workshop for 1 – 3 students will introduce Western style hand papermaking enabling you to set up in your own studio. 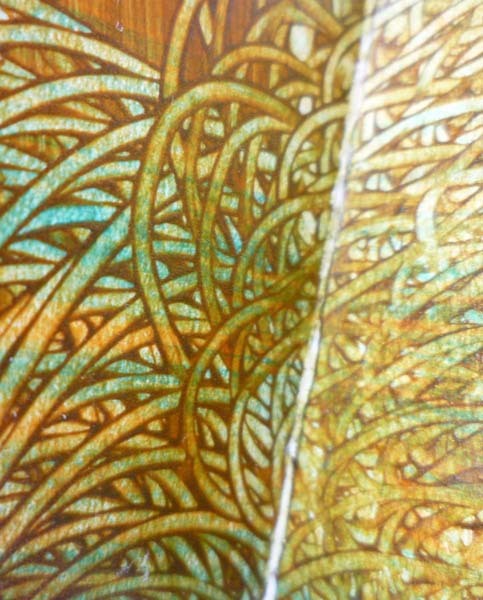 Learn pigmentation, the use of inclusions and many other different decorative methods to create papers that can be used in a bookmaking project, a collage piece or for a printing. A new medium/process that can be part of your experimental arts tool kit! All those plants out there in your garden or along the hedgerows will take on a new meaning….what kind of paper will they make? Learn how to make Western style paper by adding the processed plants fibres to create decorative papers. Learn to make Paste Paper traditionally used for end papers and book covers. 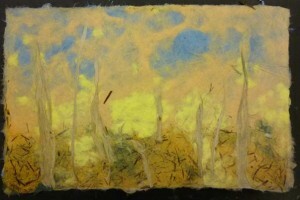 Papermaking Workshop in west London for visual books and book art projects. 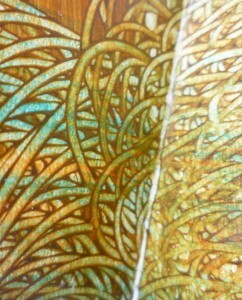 Paste paper is traditionally used for endpapers and book covers. Learn how to create your own by starting with traditional methods and then develop ways to make more creative and painterly versions. During the second session you will make a variety of paper engineered sculptural books using the paste papers by cutting, folding and revealing the designs and serendipitous images created in the first session. 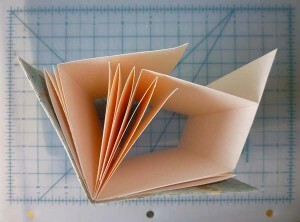 Learn to make book structures for your rubber stamp images. Learn a variety of essential book forms: accordion, sewn pamphlets and flag books. Then learn how to make your own rubber stamps and experiment with different mediums to add images to your books. More advanced level, experimental bespoke and Japanese style papermaking workshops can be arranged for groups or individuals. I will be happy your ideas and needs. The aim of this workshop is to learn how to make paper that can be used to develop ideas for the creation of a visual language within the book arts' format by developing book construction pertaining to each individual students' research and practice. This workshop is aimed at book artists, designers, graphic artists, letterpress and printmakers, fine artists and crafters. The characteristic weight, colour and texture of paper is an important element in many artists and designers work. Handmade paper, as a medium, has become popular in current arts practice because of its tremendous versatility. This 5 day course will introduce you to historical and contemporary hand paper making. You will learn both western and eastern techniques using kozo, sisal, cotton fibres. You will also learn how to process these fibres and use special pigments, learn how to recycle papers, use a variety of inclusions using both of these methods. You will be encouraged to experiment - no plain white sheets allowed!!!! Can I book my art workshop online? Yes. Please, email me to discuss the dates. Do I need my own materials to the class? All materials will be included, you may bring extra items to add to your art projects. Can I order bespoke papers from you? I work with screen printers, book artists, fine artists and designers to create specialised papers. Please email me if you are interested. Can I buy your had made paper in London? The print makers supply shop ‘Intaglio’ in south London sell my chine colle papers. You can also email me to order hand made paper and bespoke paper.